“Oh my God”, I exclaimed. What a moment. What an impact. I could not believe my eyes. The Bison are incredibly beautiful, incredibly powerful, and immensely full of Religious Purpose. The Cow is ready and the Bull is scenting the air. The act of conception is about to be fulfilled, and a new Life is about to be created. — John Robinson, for the Bradshaw Foundation. 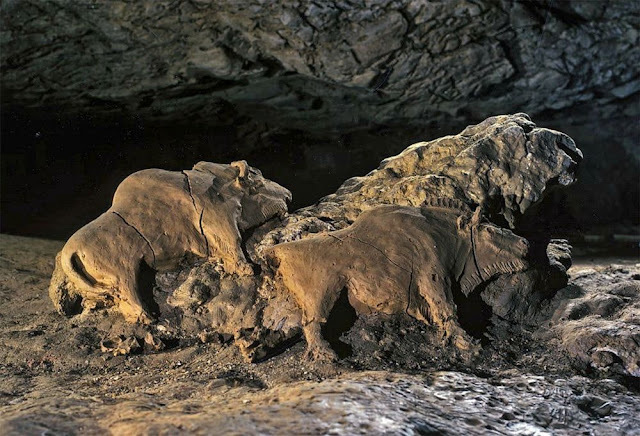 The three teenage Bégouen brothers must have felt the same when they stumbled upon the sublime sculptures of the bison while exploring the Tuc d'Audoubert cave in southwest France, in 1912. Radiocarbon dating tells us that the sculptures are 15,000 years old. The Tuc d'Audoubert cave is located in the commune of Montesquieu-Avantes in the Ariege department of the central Pyrenees, in southwest France. It is part of a network of subterranean passageways which is divided into three caves— the Tuc d'Audoubert cave in the west; the Trois Freres Cave in the center; and Enlene Cave in the east. These three caves contains a variety of prehistoric artwork including rock engravings, cave painting and sculpture, of which the best known is the beautifully carved relief sculpture of a pair of bison. The bison reliefs are two feet in length, eighteen inches in height and about 3-4 inches deep. They are modeled in clay, and their surface was given a wet finish in order to make them smooth. The marks of the artist's hand and the tools used to draw the details of the face and mane are still clearly visible. The bison’s shaggy mane and beard appear to be carved with a tool, but the jaws are traced by the sculptor's fingernail. Both animals are supported by a central rock, and are unbelievably well preserved although they have suffered some drying out, which has caused some cracks to appear across their bodies. Also in the chamber are two other bison figures, both engraved on the ground. The sculptures are located about 650 meters from the entrance to the cave. The Tuc d'Audoubert cave has been known since the late 17th or early 18th century, although the bison reliefs were not discovered until 1912. The three caves are owned by the family of Count Begouen. The site is now closed to the public in order to prevent damage from tourists.